California's golden trout need cold, clear streams. But grazing cattle, uncertain snowpack, and drought are putting these fish at risk. The California golden trout, with its vibrant orange and red color, is often called the most beautiful trout in the world. But it’s in hot water … literally. The trout is native to the tributaries of just two California rivers and requires cool water to thrive. That’s provided by melting snowpack that trickles down from the mountains. Shade from willow trees along the banks also helps keep the water cool, ideally below 68 degrees Fahrenheit. But Michael Carl, an angler and conservation writer, says those willow trees are being destroyed by local cattle that are overgrazing the area. Add heat and a prolonged drought, and the water gets dangerously warm. During a five-year study, two streams reached 79 degrees Fahrenheit or 26 degrees Celsius. The golden trout is not on the federal Endangered Species List, but California is monitoring its population carefully as global warming makes it harder for the fish to find cool water. Reporting credit: ChavoBart Digital Media/Andrew Lapin. 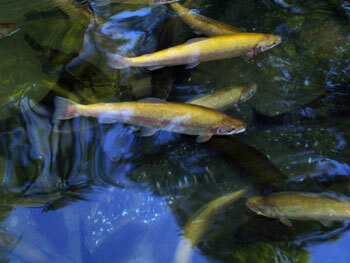 Photo: Golden trout in natural environment (copyright protected).